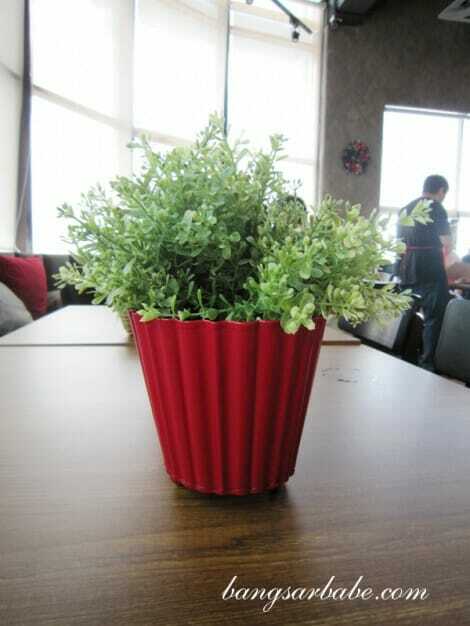 Of late, rif has taken a liking to eating at cafes during weekend lunches. 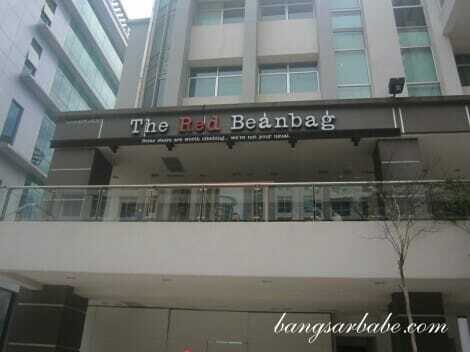 We chanced upon The Red Beanbag while strolling around Publika and decided to give it a try. 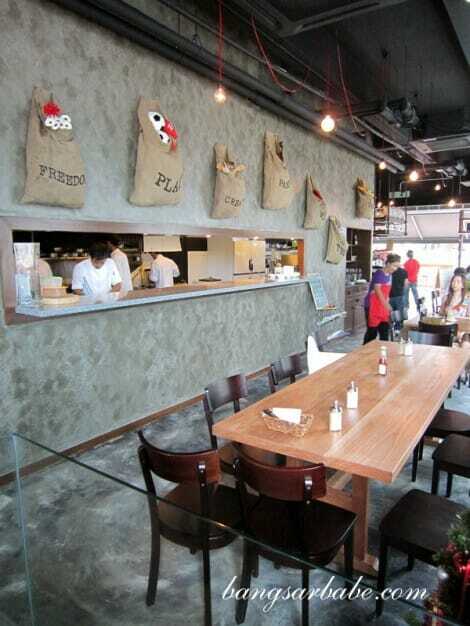 I liked the décor of the place – the outlet was bright, spacious and airy with an open kitchen. However, the sofa seats were slightly narrow. When you add a pillow behind, it’s almost impossible for a normal adult to sit without finding the space cramped. Service was friendly that afternoon; our waiter was a pleasant chap who always had a smile on his face. 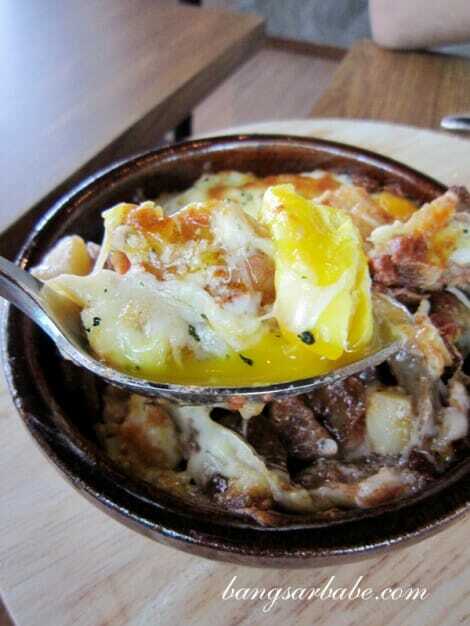 We shared a traditional beef burger, shroom shroom and baked eggs from the all-day breakfast menu. I didn’t order their coffee since I just had a cuppa an hour before. That calls for another visit, as the latte someone had at the next table smelt pretty good. 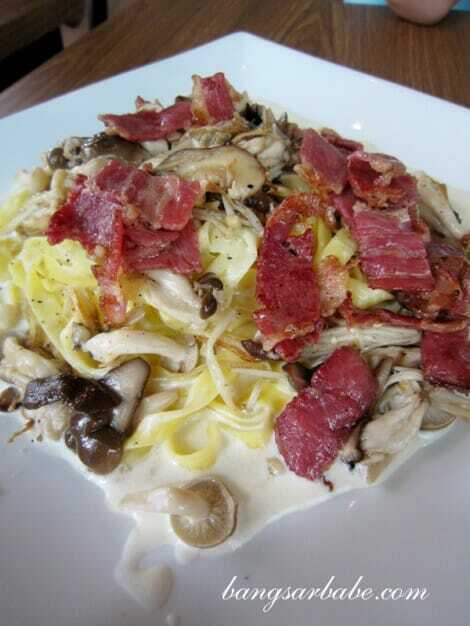 The shroom shroom (RM19.90 – entrée, RM24.90 – mains) was essentially a mix of mushrooms, bacon bits and homemade fettuccine in cream sauce. 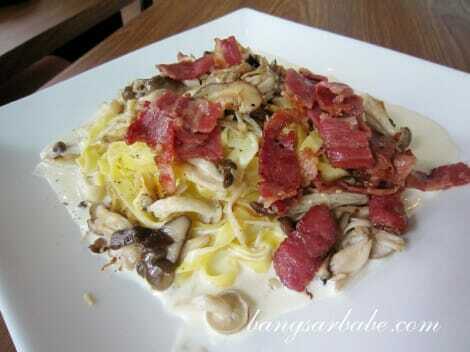 This was less creamy compared to the carbonara sauce, with an earthy aftertaste from the assorted mushrooms. Quite decent, but if you’re a fan of thick and creamy carbonara sauces, you might not enjoy this as much. The homemade fettuccine was cooked al dente, but the cream sauce could have been more ample to coat the noodles better. They were pretty generous with the mushrooms and bacon bits so that’s a plus point. I liked the traditional beef burger, which came on a wooden serving board with a side of chips, better. For RM22, portion was decent. 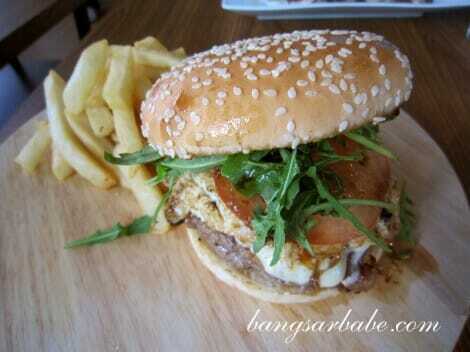 This burger was an assemblage of homemade beef patty, fried egg, beef bacon rashers, tomatoes, cheese and burger bun. 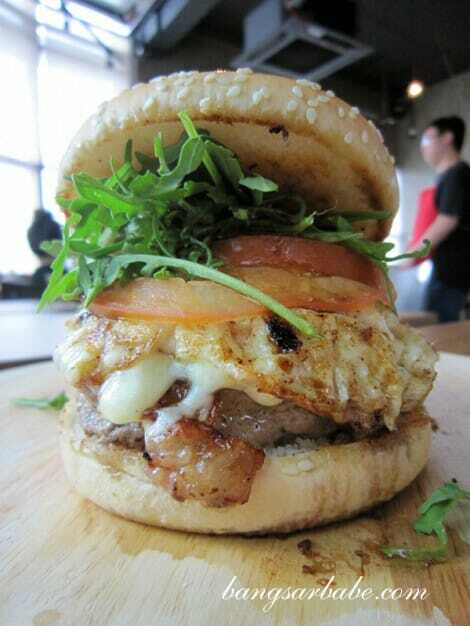 The runny yolk gave the patty a richer flavour and the bacon rashers gave it a salty touch – not bad, I thought. I didn’t care much for the fries as some parts were soggy from the patty juice. 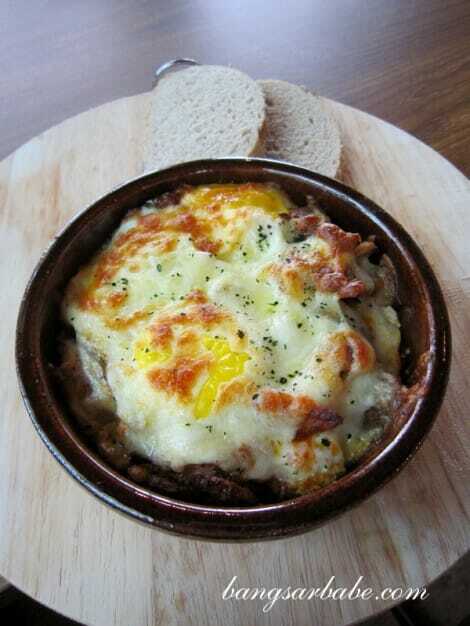 The baked eggs (RM17.90) boasted a combination of eggs, lamb bratwurst, cheese, potatoes and sundried tomatoes, served in a baking dish. I wished they gave more than two slices of crusty bread – there wasn’t enough to go with the eggs. Stronger spices were used (or it could just be the lamb), so the flavours were more assertive. 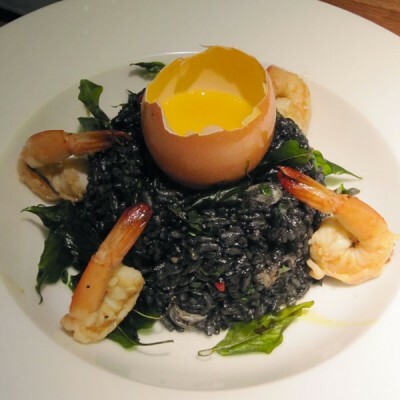 The eggs were cooked just right, giving it a creamy egg white texture and an even creamier yolk centre. I was inspired to make my own baked eggs after having this. For dessert, we tried My Nutty Professor (RM9.90) which we found quite disappointing. 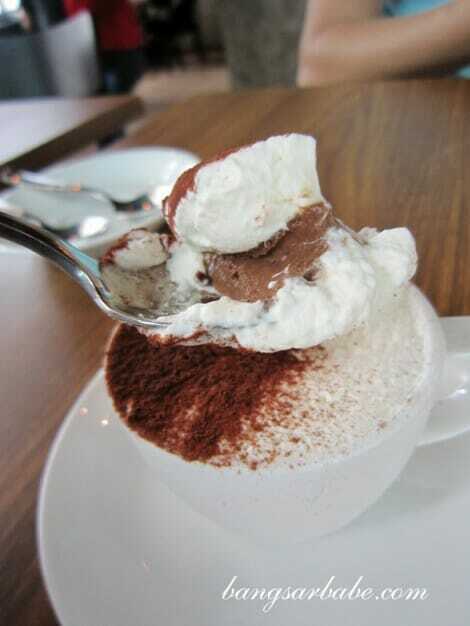 This comprised chocolate mousse and nuts served in an espresso cup. I found this dessert rather plain and the nuts did little to the mousse. Portion was also quite small. After the delicious eggs, this was quite a nutty shock. Overall, I liked the place and found the food pretty tasty. There is no service charge or tax at the moment (yay!). Verdict: Good service and hearty dishes. 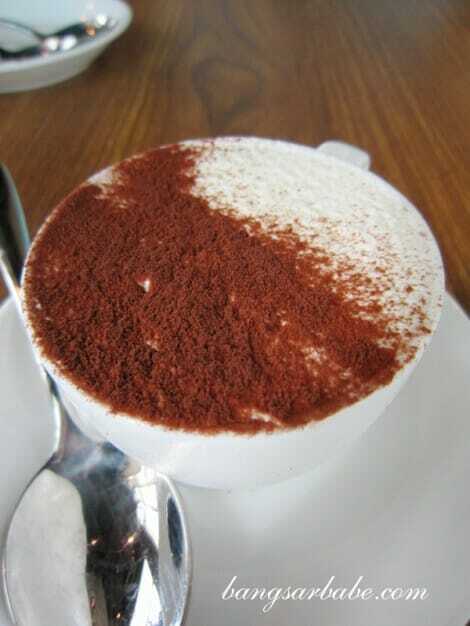 I haven’t tried too much of the menu at the Red Beanbag, but I did like their coffee. The burger served on the bread board looks good. I have a friend who works here! 🙂 But only on weekends. Must be quite fun working in such cafes hor? I think it shouldn’t be a problem. Wanted to ask for more sauce too, but the kitchen looked pretty busy and I didn’t want to have to wait long. Regine, I don’t know if you actually READ my blogpost properly. “We chanced upon The Red Beanbag while strolling around Publika and decided to give it a try.” We went there, ate and PAID for our meal…like we always do on a regular basis. I don’t do invited food reviews on a regular basis, and when I do, I always mention it’s invited. You are entitled to your opinion on the food, but I do not appreciate being accused of doing invited food reviews when it is not in this case. from this review.. i think that your ending is contradicting whatever you wrote at the top. How do you come up with a verdict that this place has hearty meals when you said their dessert was disappointing and cramped sofa seatings with their pasta looking awful with the runny sauce. 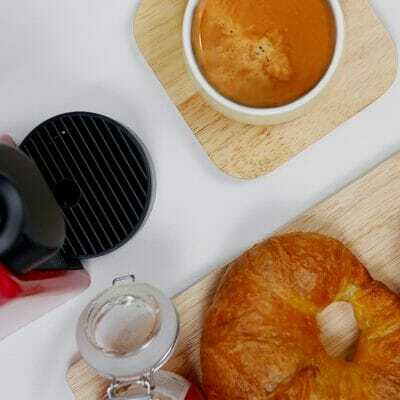 RBB boasts of being a australian concept cafe and is far from what it is. Nothing aussie about the food at all. Maybe you should re-review them and give them a proper rating.. coz nothing is good there except for the indonesian waiter. 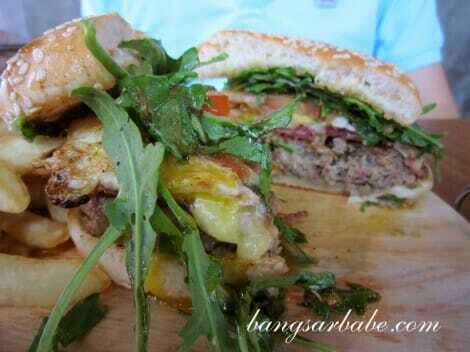 I mentioned that I enjoyed the burger and baked eggs. Those items to me, were hearty and decent in taste. The pasta wasn’t bad, but it wasn’t my kind of food as I like my pasta to be creamy. That doesn’t mean it wasn’t tasty. Yes, the sofa seats were cramped with the fluffy pillow behind, but it wasn’t the case when the pillow was removed. If you opt for their regular seats, I believe you don’t find them uncomfortable. I agree that the dessert I had was disappointing, but I am in no position to judge their other desserts or food items as I have yet to try them. My conclusion was based on my dining experience that afternoon. Seems like many people dislike this place and the food. I will have to pay this place another visit to see if what you (and a few others) claim is true.